Like Ralphie from The Christmas Story waiting for his Little Orphan Annie secret decoder pin to arrive in the mailbox, we’ve been dutifully checking our email inboxes and social media feeds for any news on new music coming down the pike from the King of Country Music himself, George Strait. Look, “Código” is fine for what it is, and maybe even pretty good. I’m speaking of the song that is. Never tried the tequila. “Código” is George Strait singing. It’s son Bubba and Dean Dillon helping to write the tune. There’s fiddles and steel guitar, and even a little bit of squeeze box. The starch is fresh and crisp in George Strait’s jeans. Everything is in the right place here. It’s a classic country drinking song, and not too absorbed in itself. But it’s just a little less than the ideal way to present a new song from George Strait, especially since this is the first taste of new music from Strait since 2015, aside from a couple of bonus tracks from Strait Out of the Box, Part 2 a couple of years ago. 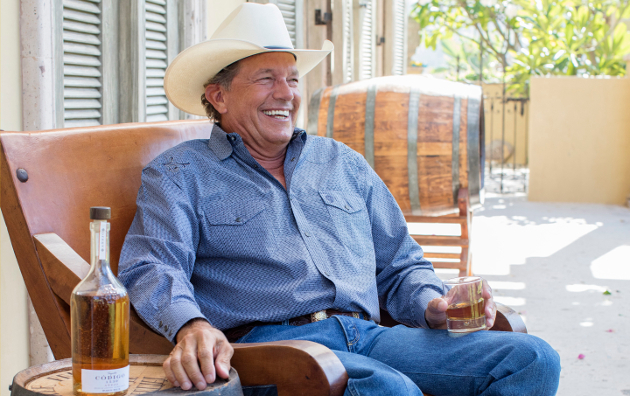 George Strait invested in the Código Tequila Company in 2016. It’s probably a cool little passion project for him. God knows he doesn’t need the money, but like the rest of us, he’ll take it if it’s there. It’s something interesting to keep him busy during his semi-retirement. It’s a hobby, and it’s not unusual these days to see folks dabbling in spirits as a side endeavor. Código is an ultra-premium tequila that was consumed privately by a small group of Mexican families for years before becoming commercially available. Strait apparently became hip to it when vacationing in Mexico. It comes in a variety of different “expressions” such as Blanco and Reposado, and can go from $50-$300 a bottle. But when you start to blur the lines too much between what is a song and what is commercial, it ceases to be cool. We get it when an artist wants to make a little pocket cash with a product endorsement. Everyone’s got to eat. Or in this case, drink. But keep the division lines clear. The song “The Middle” by EDM star Zedd sang by Maren Morris was just nominated for two Grammy Awards. It was originally commissioned as the backdrop for an extended commercial by Target that played during last year’s Grammy presentation. But the song itself isn’t about Target. There’s no reason to get too hot and bothered about “Código” – the song that is. Again, I haven’t tried the tequila, but the more you spend, the better it tastes … or at least that’s what we tell ourselves. But this song should have been an album cut, or maybe the third song released from the new album, not the first. Yet just like a fine aged beverage, country artists seem to get better over time to the point where it almost doesn’t matter what they sing about. The weight of their legacy carries such a magic unto itself. It’s just fair to want to make sure George Strait’s magic doesn’t lose it’s luster in the pursuit of commercial conquest. But once you get used to the bitterness, “Código”reveals itself to be finely crafted. It goes down smooth, with a robust aftertaste. It’s there to be enjoyed, and it’s hard not to. So you know, enjoy responsibly I guess. 0-3, don’t quit your day job, bubba. Great song. That said, I usually love anything by George Strait, and maybe it’s just me craving ANYTHING new by George, but I love this song. It plunks you right down in aTex-Mex boarder dive, maybe a little outdoor deck with the sun on your face. Feelin’ good with a drink in your hand watching the ice melt. Perfect for these cold December days up in Pennsylvania. I can’t wait to hear more. Brang it, George! Good song as is everything by King George, even if it is a blatant ad for the Tequila company he co-owns. Strait is an obvious legend, but this song does less than nothing for me. A hard pass. Still excited for a new album in 2019! If I hadn’t read the article before hearing it I would absolutely love it. The lyrics are fun, the music is tight, and it’s got an up-tempo western swing beat tailor-made for two-steppin’ across the hardwood. Listening to it knowing that he’s an investor, I still like it, but it does feel like a blatantly self-serving commercial. At the end of the day I’m going to give King George the benefit of the doubt and assume that this was what they had in the can so they decided to throw it out there and see what happened. I read the article and still like it. Maybe learn to form your own opinion on something..? Check out the 9th through 12th words in the second sentence: “I still like it”. Maybe learn to read an entire comment before sticking your foot in your mouth or something..? It’s laughable how all of the new ” country ” acts throw a bone to the genre with a token banjo intro or a steel guitar buried under an avalanche of fake hand claps , drum layers and pads , maybe a les paul on 11 . then with one song George makes ’em all look so idiotic and shallow . give me this on my COUNTRYy station all day long . A 3 min. commercial for the George Strait tequila? Well…it’s George Strait & the song is not bad. Not great…but good enough to be played again. Let’s hope “Codigo” will not start a trend…”…here is Candy Overwood with her new power ballad…Tampax”. Hope Candy has a lot of cash to buy Proctor & Gamble. Candy did the right things at the right time. Country star, owner of P&G & leader of the church of candyology. Right now she is selling a nose-hair-remover on QVC. Not a song for me. Why does he give the Spanish word Código the English pronounciation? cuz he’s George F****** Strait . Ah what the heck, its King George and its new! It sure would be nice to have a new one from him and Alan Jackson in 2019! Give country a good kick in the pants. I never need to hear it again. And if I bought a $300 ticket to sit in the rafters in Atlanta and this jingle took up a spot on the set list, I’d throw my hat in disgust (although I’d be nowhere near the stage for it to reach it)! I really thought this next chapter in Strait’s career would resemble Johnny Cash’s American Recording phase … club shows, artistic recordings. Instead we are getting slick jingles and uber stadium shows. I mean, I like George and he’s an obvious legend, but he has never seemed the type to go the Cash route with his material. My guess is both he and Jackson will wind down their careers similar to Don Williams. Cutting a couple of records that embrace what made them legends. Neither is going to cut the American Recordings 2.0. Nor should they, that would be totally out of character for them imo. YEAH ….George has always cut albums with a variety of songs and styles all falling under the umbrella of COUNTRY music . He’s made it obvious in that repertoire and in interviews that he wants to reflect HIS inspirations while giving his loyal fan base exactly what they want and expect from him . H’e a fan guy …..not a GEORGE guy . Its all about respect for the hallmarks of the genre and the people who’ve supported him …..and , of course , many many great songwriters . Anything more at this point would , indeed,be out of character for him and even disappointing to his loyal fan base . BTW….IMHO this song is an absolute clinic in how to write , arrange, play , sing and produce a GREAT-sounding COUNTRY record ….a CLINIC ! THIS is the kind of focused approach the Pistol Annies should be shooting for with their sound . Instead , much of their stuff ( and so many other acts ) falls through the cracks when it comes to production skills. I will reference KC Musgraves only to make this point . Her latest album totally taps into that focus and consistency of production and arrangements in order to give the project a character overall . It is NOT trying to be all over the map musically chasing trend on one track and giving over to artistic vision on the next . George , for all te diversity in styles manages te same feat time and time again . His albums have a ‘glue’ in terms of vibe which helps them hang together as a focused set . 2009’s Twang had some American Recording moments like Arkansas Dave and El Ray that really got my hopes up for a creative shift. Johnny Cash had 3 terrible commercial albums in the mid 80s before he was dropped and he had a ceative come to God revelation. I wouldn’t mind seeing a creative shift either, but it does carry risk for the George Strait brand as well. Releasing decent, but ultimately forgettable records like Cold Beer Conversation helps fill Vegas residency shows. Not sure an edgier/deeper record would do the same. I mean, come on. Merle Haggard, a major model railroading enthusiast did an entire album about it, with photos of his collection of models on the front and back. If George Strait is a craft booze enthusiast and he wants to write a tune about what he lives and likes, great. The Tennessee Mafia Jug Band did an ENTIRE album of drinking songs basically funded and for sale from the Short Mountain Distillery, and it’s a GREAT album. I can see some concerns that this should have been an album cut, and I can see why people might think that. Yep, I agree with this pretty much. At this point in his life and career he can do whatever he wants and I’m fine with it. It’s not like he could get any major country airplay at this point anyway so I say do what you want. The Haggard comparison is off because Strait directly benefits if this song takes off and his tequila brand gets a big sales bump. Merle, while loving model trains had no financial stake in a specific model train company getting a sales boost. But I agree George can do whatever he wants at this point in his career. I see this as being no different than what Jimmy Buffet does with his various brand and how he ties them to his music. Jimmy Buffet would be a good example of going too far with this stuff. Many think of him as a caricature of himself for that reason, even though his musical legacy is much deeper than people give him credit for. George is one of my favorite male singers! I can sing any song he does too,which I thank God for,because I Love singing his music! It’s a commercial. Nice jingle. Personally I like the song, even if it does come off as a commercial. At least it SOUNDS country. On another note, Trigger, do you know who George’s new drummer is in the wake of Mike Kennedy’s tragic passing? It’s Lonnie Wilson. Gonna have more on this soon hopefully. Any bets as to whether we’ll be hearing “Sweet Country Music” on George’s shows in the future? People should listen with their ears, not their head. Catchy bouncy tune, really well played, going for the original texas swing feel,smoothed up a bit. Trig nailed this. George doesn’t need the money. He’s hawking wares. It’s a well-done commercial. Golf clap. Now move on. I love it George cheers! Why let an article influence your opinion about a song? If you like it, then good. Who gives a flyin’ rip what is said about it? Music critics have NEVER influenced me as to whether I like a song or not. I listen with my ears. I have no opinion about the song itself. It is o.k. to my ears. So it isn’t a defense of the song, but it is a defense of how one should judge whether they like a song or not. BE YOUR OWN JUDGE AND CRITIC. To clarify, the article didn’t influence my judgement in any way, shape, or form. Knowing that Strait has a business relationship with the company is what makes the song feel like a commercial to me, the article just happened to be the way I learned about it. My feelings about the song are no different than if I’d first heard the song independently of learning that he was an investor of the company. And as I pointed out to somebody else, neither the article nor the fact that there is a business relationship makes me dislike the song, it just makes me look at it differently. Rest assured, I am my own “JUDGE AND CRITIC”. I’ve never let the opinion of someone else influence my own opinion, and I don’t see that changing anytime soon. Heck, if anything, hearing someone else’s opinion about a song tends to make me want to feel the exact opposite about it. That one sentence says a lot. If this was released by anyone else, nobody would give it the time of day, IMO. I think the people that like it are also biased by the fact that it has some swing and sounds country…ok that gets some points these days, but enough to make it a good song? It’s a little repetitive for my taste, but other than that I like it plenty. One of the things that frustrates me about Trigger’s ranking system, is that he grades actual C(c)ountry songs like this one on the same scale that he uses to grade Pop songs posing as country. I don’t love this song, but it is C(c)ountry, which puts it in an entirely different playing field than a lot of the crap that he reviews on here, some of which receives higher rankings. And is it just me, or is seeing George Strait all wrinkly and turkey-necked, with gray hair, a hard pill to swallow? It’s the fact that this song is so country is one of the reasons it didn’t receive a negative grade for being basically a product jingle. I do consider how country a song is in my calculus, even though sometimes a song is so good, concerns about genre become become marginalized. However if you think I have a “ranking system,” the joke’s on you. Ultimately it’s the review that is the opinion on the song. The grade is just an off-the-cuff “whatever feels right” kind of number that I purposely try to keep strange so it’s never taken too seriously. Better than died hair and plastic surgery- you better hope you look as good as he does at 60+. Yeah, I prefer the look of the aging George Strait to that of the aging Kenny Rogers. That’s the problem with most bro and country pop songs–everything comes too easy. George Strait has some happy songs, but they are never shallow. As authentic as Codigo sounds in the Texas swing tradition, it’s too smooth (good for tequila, bad for country music). New album “Honky Tonk Time Machine” announced at last night show. Has there been an official release date? I love that album title! You folks worried about a shift in George Stait music just hold your horses. I listened to three of the new songs on the album (including this one) sang live from the Vegas show just yesterday, and I can assure you there will be no letdown! And this might not even be a radio single (like they’d play it anyway), maybe just one he put out there. But if it is, play it again for me. The Kings reign isn’t over just yet! I still want him to make a full album with Benson and Asleep at the Wheel behind him. Listened to it twice…. it’s The King…. it’s country… it’s catchy IMO. I’m ready for a shot…. where’s my Don Julio 1942 ??!! I like it, I think he’ earned an indulgence for putting out so many great consistent albums. I might even go try and find me a bottle, not sure if it’s sold in Virginia, but heck I’ll look. This feels more like a song released to create some buzz for George’s new album. I wouldn’t be surprised if an actual lead single gets released in January and based on what he sang the other night in Vegas “Every Little Honky Tonk Bar” sounds like a great choice. On a side note I’ve found a couple restaurants in Austin that carry Codigo and I do quite enjoy it! This song is fantastic, the music is just right, thanks George. That’s a good story about the tequila, but not entirely accurate. The guys that introduced Crocs are doing the same thing with tequila, presented it to George as an investment opportunity, and they wanted a face for the product like Sammy Hagar for his brand. I like the arrangement because now I can get free, primo GS seats any time I want to go to a show. The CEO is my neighbor in Colorado. This is 1000 x more country than anything on the radio right now. The song is patented George Strait, right down the middle and takes no chances. Which is fine. Not a SOTY candidate by any stretch, but good enough for a little fun on Saturday night. Point taken regarding the commercialism, but as he doesn’t start making every release a commercial jingle, and as long as the jingle is good enough I want to listen to it regardless of the product, I have no complaints. PS, do you think Bubba wrote this and Norma ‘made’ George add it to the album??? Eww. Headache in a bottle. Isn’t that what tequila is? But then I only buy bourbon by the half-case, so what do I know. As to the music, if at this point this is what he does, it’s fine. He’s earned a pass anyway. More, please. George, always been a fan….but does the world or country music fans need another drinking “addiction-fueling” substance abuse song? Do you need some extra cash, so you’ve determined to start your own brand, then promote it with a snappy song? I really like your songs, but this reeks of commercialized alcohol self-promotion. It’s ugly, its erodes your good name by making your “Swan Song,” something that seems a off in it’s motivation and influence. Not a fan of this song. Haven’t been a huge fan of his new music since about 2010, it’s not bad, it’s just missing the feel of his earlier music, especially from the 80s and 90s. I was hoping he would get out of this slump he’s in, but this just does not do it for me. Huge let down.